WASHINGTON, D.C.—Medicare’s largest ACO initiative – the Medicare Shared Savings Program (MSSP) — where most ACOs do not bear financial risk for holding down spending — generated gross savings of $1.84 billion for Medicare in 2013–2015, nearly double the $954 million estimated by the Centers for Medicare and Medicaid Services (CMS). 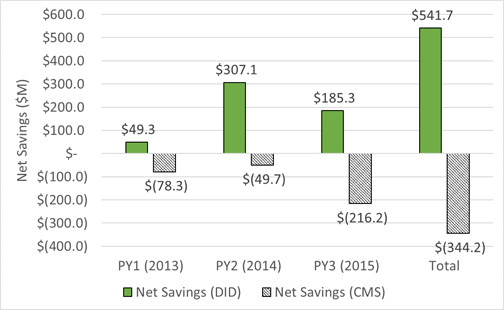 MSSP ACOs reduced federal spending by $542 million after accounting for shared savings payments earned by the ACOs. The new study, which is discussed in today’s Health Affairs Blog, uses rigorous and widely accepted research methods to measure savings. This contrasts with CMS’s claims that ACOs increased Medicare spending by $344 million over the three-year time span based on administrative formulas used by the MSSP to measure performance and calculate shared savings payments (see Exhibit 1). NAACOS commissioned Dobson DaVanzo & Associates to conduct an independent evaluation of ACO performance using rigorous and widely accepted statistical methods to analyze Medicare claims data from approximately 25 million beneficiaries per year. The study is the largest ever of ACO performance based on Medicare claims. The Dobson DaVanzo evaluation report, titled ”Estimates of Savings by Medicare Shared Savings Program Accountable Care Organizations: Program Financial Performance 2013-2015,” is available online. Most experts agree that moving from volume-driven fee-for-service payment to value-based payment that rewards better patient outcomes and lower costs is key to getting more value for the $3.3 trillion spent annually on U.S. health care. The ACO model is a market-based solution to fragmented and costly care that encourages local physicians, hospitals, and other providers to work together and be responsible for improving quality, enhancing patient experience, and reducing waste to keep care affordable while maintaining patient choice. The MSSP is the largest value-based payment model in the United States, growing to 561 ACOs with more than 350,000 providers caring for 10.5 million Medicare beneficiaries in 2018. Under current MSSP rules, new ACOs are eligible to share savings with Medicare for up to six years if they meet quality and spending goals but are not at financial risk for any losses. Despite the growing ACO track record of improving quality and saving Medicare money, CMS, in an August 17 proposed rule, moved to shorten the time new ACOs can remain in the shared-savings-only model from the current six years to two years. Data show ACOs need more than two years to begin showing the benefits of forming an ACO. That proposal, coupled with CMS’s move to cut shared savings in half — from 50 percent to 25 percent for shared-savings-only ACOs — would deter new Medicare ACOs from forming. Extend the permitted time for ACOs to remain in a shared-savings-only model for ACOs. Restore the shared-savings rate to 50 percent for ACOs that do not take financial risk and those in low-risk models.